luxury homes in Austin. As a well renowned custom home builder, it has satisfied home owners for years with new rooms and spaces that fit casual lifestyles and are still suitable for upscale entertaining. 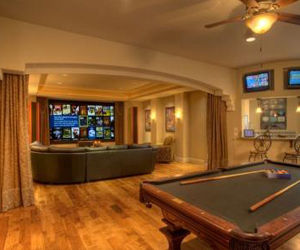 One of these innovative spaces is a combination media and game room. Game rooms used to be shoved in nooks and crannies of the home and often reserved as a play space for the children. These new game rooms are integrated with upscale media rooms, making them the perfect place for your child’s birthday party or a get-together with friends. The inviting and entertaining, highly customizable spaces truly provide the best of both worlds.